DE FER -La Castille Vieiele et Nouvelle L'Estramadura De Castille Et De Leon. . .
DE FER, N - La Castille Vieiele et Nouvelle L'Estramadura De Castille Et De Leon. . . 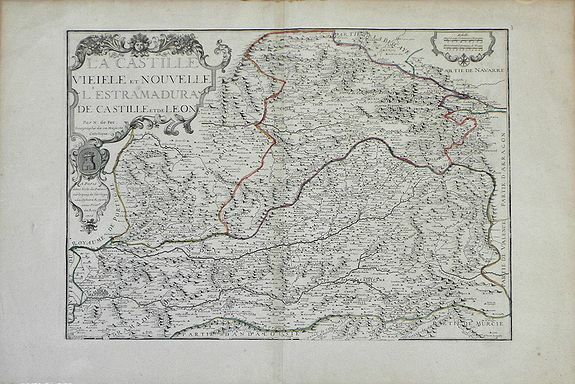 Title : La Castille Vieiele et Nouvelle L'Estramadura De Castille Et De Leon. . ..
Map maker : DE FER, N.
Size : 21.3 x 30.0 inches. / 54.0 x 76.2 cm. Description :Beautiful, detailed map of the Leon and Castille regions of Spain by Nicholas de Fer. The cities of Madrid and Toledo are depicted, as well as the mountains, forests, rivers and villages of the area. An illustrated title cartouche, showing the coat of arms of Castille depicting a castle, is at the top left corner of the map. French cartographer, geographer, engraver and publisher Nicholas De Fer (1646-1720) took over the business begun by his father Antoine De Fer. Nicholas was a prolific publisher of maps and was appointed Geographer to the King. Among his works are several atlases: France Triomphante in 1693, Forces de L'Europe 1696, Atlas Curieux 1705 and Atlas Royal. Condition : Small repaired tear (approx. half an inch) on left edge; a few very tiny wormholes in left margin; some discoloration along edges; minor foxing in margins.